This year our school is involved in a 2 year Erasmus Plus KA2 Project called 'European New Generation' with school sin Greece, Turkey, Finland, Denmark and Croatia. The theme of our project is maths, science and the arts: the STEAM subjects as it is know referred to. We started the project off with a teaching event in Izmir, Turkey in December when 3 of our staff travelled there to meet up with all the other schools and began to plan out the 2 year project. We will host a visit form the partners in April. 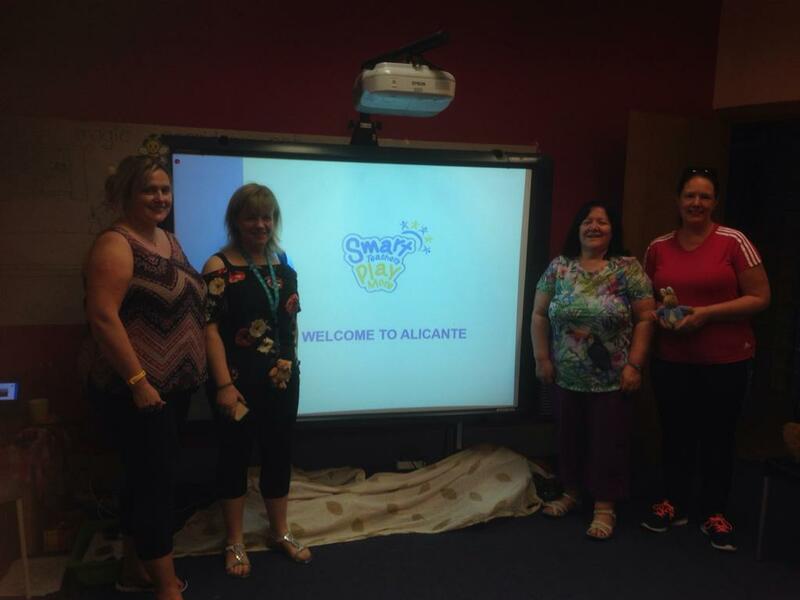 This project has come at the perfect time for our nursery and foundation Stage classes as all the staff in these classes have also had the opportunity to take part in some Erasmus Plus training through a KA1 Project with 'Smart Teachers Play More' in both Alicante and Reykjavik. 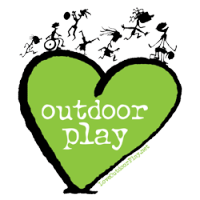 This course emphasises getting children moving whilst introducing new key concepts like colour, shape, number and also literacy. The children are really embracing all the opportunities to have lots of new maths activities and are particularly drawn to playing with the bigger dice and finding numbers in their environment. They love looking for shapes as well and I just drew some shapes on the playground and made a simple dice with the shapes on it so they could make up their own game. Rolling dice and finding the same number of objects. Enjoying life through the eyes of a child. The path was glistening with lovely light 'snow'. 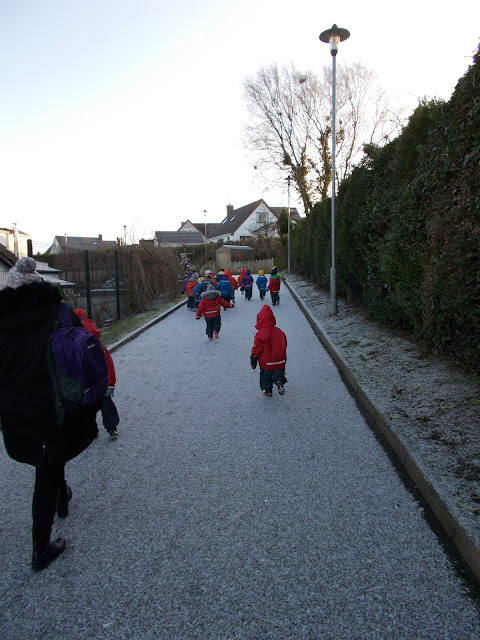 This morning as the children arrived for class it began to snow, very light snow like icing sugar but snow nonetheless. 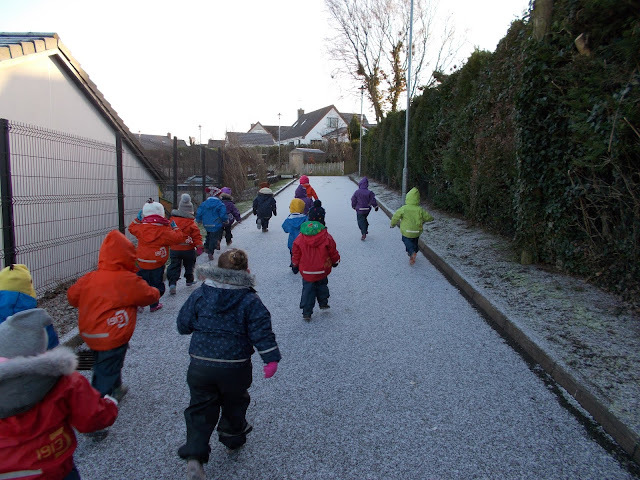 The children were so excited and rushed to get on their wet gear, or as they called it today 'snow gear' and had so much fun exploring the playground with this new dusting of snow on it. 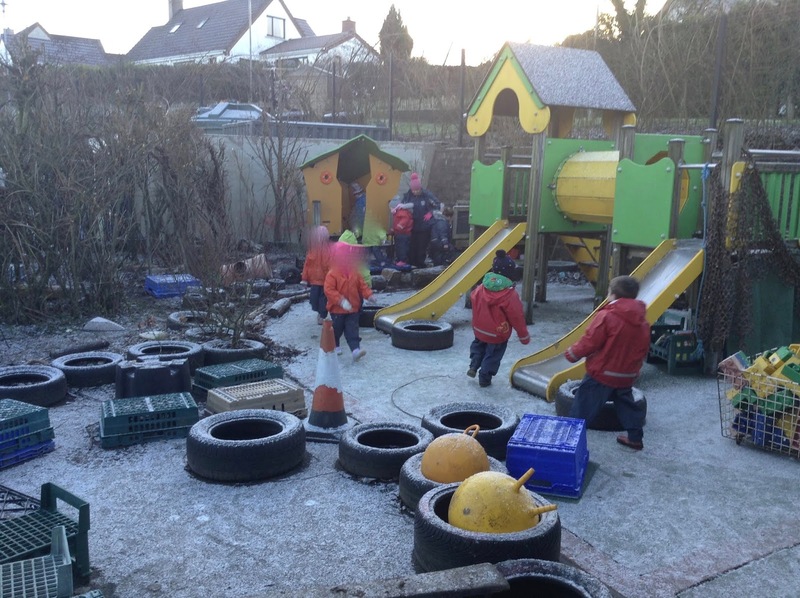 There was much celebration of there being so much ice in the mud kitchen and the had fun zipping down the icy slide. They experimented with pouring water on the snow and seeing what happened, lots of cries of 'It's disappeared', 'Did it melt?' etc. could be heard. When everyone was all dressed we head up to visit Bear Woods to see if there was snow up there too, the children were amazed to that they could still see the white line where they stop on the path under the snow. There was a little patch of snow up in Bear Woods and they had fun climbing on the big log, rolling down the hill, hunting for sleeping bears and avoiding wicked stepmothers. The children were amazed that their little hiding places were so visible now that all the leaves have fallen off the trees. Bear Woods looks very bare at the moment but the class still love being up there. It was truly wonderful to see the joy of light snow in their faces and it reminded me once again, what a privilege it is to work with young children and experience the everyday as magical. And it was even better as they had made some paper snowmen the day before. So, I have finished my 4 week study travels as a Churchill Fellow. I actually can't believe how quickly the time went by, as initially I thought 4 weeks away from home would seem like a long time. It has been amazing to actually live in another country for an extended period and to get the opportunity to live like a local as opposed to being a tourist. After this time spent talking to various people on the ground dealing with children and parents from migrant backgrounds on a daily basis in Dresden, Berlin (Germany) and Norrköping & Stockholm (Sweden) there is a common theme running through all the discussions - language acquisition and communication between parents and children. Whatever the home language of the family, all those I have met with have all agreed that it's not about what language a child hears at home but how much of that language they hear and therefore can begin to use themselves. I love this quote from James Britton "Reading and writing floats on a sea of talk" and it sums up perfectly how important communication is for all young children but particularly those who are trying to learn a second or third language. Early years settings - be they daycares, kindergartens, preschools or nurseries - should be places filled with the noise of children and adults communicating. Those of us who work with young children know that they can communicate by more than just speech - they hum, sing, makes noises and move when communicating. I have so many things to reflect on from the past 4 weeks but the one big thing that I have taken away is that in the UK context, our children are being asked to be quiet and listen too early - if literacy floats on a sea of talking why are we so keen to have children writing and reading at the age of 4 or 5? The young children I met in Germany were confident communicators, it was obvious they had had lots of time to watch, listen and talk rather being expected to listen and then write. 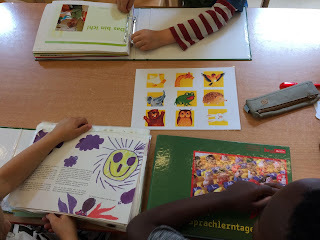 The 5 and 6 year olds talked fluently (many in their second language) whilst sharing memories provoked while looking through their 'Language Learning Diary' with me and other members of staff. The 'Mein Sprachlerntagebuch' was introduced by the Senate Department of Education Berlin as part of their initiative to make parents realise the learning that was going on in the kita. What I particularly like about this document is that it involves the parents from day one - they are asked to fill in the early pages 'What they child likes, dislikes, favourite toys, food, siblings etc' so that the staff can build up a picture of the child and use it help comfort the child at settling in time. 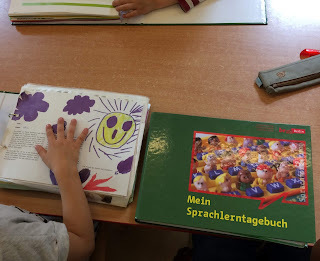 Many settings have an 'All about me' type document that is similar but the Berlin one is more of a working document and is added to over time, and used to record the child's language development over their time in the kita. There was a little girl from Poland in the group that was looking at their diaries and when asked if she wanted to talk about the activity she had taken part in earlier that day to record in the book, she said no but did enjoy looking through the book and got very excited when looking at photos of her cousins. 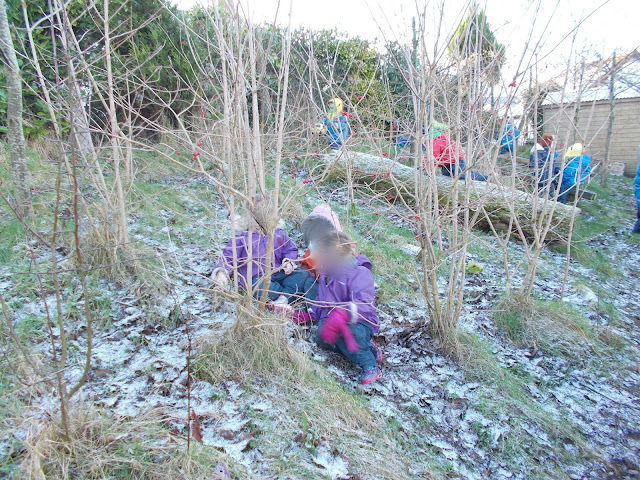 When she headed outdoors the teacher explained that she had been selectively mute until recently and by flicking through the diary she was able to show us exactly when the child had first spoken in the kita and what her first word was. (Incidentally it was chocolate!) This is when I saw the full potential of this document and how it could be something we introduce in our system to help staff and parents see the language progression at a glance. A huge thanks to Dr Gesina Volkmann from SFZ Berlin for taking the time to meet with me on numerous occasions to explain the important work her organisation does in relation to language learning. I have much to mull over from my 4 week travels and a report to write but for now I am taking the time to try and write posts about some of the observations I made. Finding Solutions not Focussing on Problems. 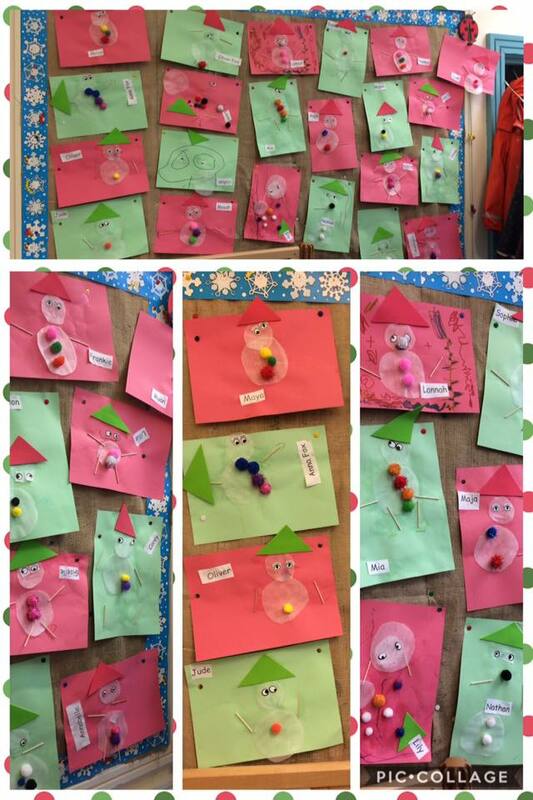 As a preschool teacher I was so curious as to what was happening in the kindergartens if at almost every primary we visited teachers were saying 'If the migrant children have been to kindergarten then they don't need to come to the Welcome classes' I wanted to find out what strategies were being used to make sure the youngest children were up to speed with their German by the time they went to primary aged 6 and were fully ready to be integrated into the mainstream classes. Reached out to some of the organisations I had come across in my previous visit and one DKJS (https://www.dkjs.de) pointed me in the direction of a kindergarten in Dresden called 'Kleiner Globus" ( http://kleiner-globus-dresden.de ) meaning 'Small World'. 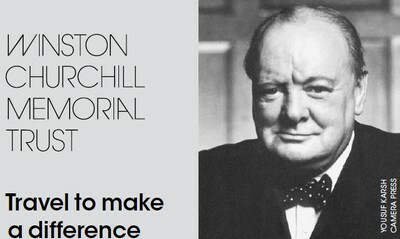 So I began my Churchill Fellowship in earnest last week with 2 appointments in Dresden, one at Kita Kleiner Globus and the other at DKJS. It was incredible to get to see around the Kita and learn their story, it is purpose built preschool set up 2 years ago with the intention of integrating children from all different types of backgrounds. The main body behind the Kita is Ausländerrat Dresden e.V (https://auslaenderrat.de/profil/) an organisation specifically set up in 1990 to support the cultural , social and political integration of migrants. A key element of this group is that the campaign for social issues that affect migrants and encourage people to stand up for their rights and help them to learn about the new culture where they now live. Some of the welcoming staff at the Kita with me. Listening to the staff talking about the Kita, I was reminded of how the integrated education movement began in N. Ireland. This kita is all about children from different social backgrounds being educated together & this is a key aspect of any integrated school back home. It was interesting to learn that it was not set up as a direct result of the recent influx of refugees but rather as a way to ensure the Russian population could maintain their own language whilst also learning German (and English if they wish) so that they are not isolated. The main emphasis of this Kita is on immersion of the languages and it was wonderful to hear the staff speak to the children in English or Russian & the children reply in German or vice versa. The atmosphere in the Kita was very relaxed and welcoming & it is very obvious that different languages and cultures are respected in the space. Because the families come from all over Dresden, the staff explained that the children are from a variety of socio economic backgrounds - unlike the norm where you might attend the setting in your neighbourhood and so only mix with those from the same background as yourself. The staff are also from a variety of backgrounds & this can only but help put families at ease. There is strong volunteer movement within the schools (I saw this in Berlin in 2017 too, where retired teachers and business people were volunteering in the Welcome classes) so there were many extra people to help prepare snack, read stories to the children etc. This made for a very calm feeling about the place & the snack was beautifully presented by the volunteers. No teacher has time to prepare a snack as beautifully as this! I had an opportunity to talk to some of the staff and they explained how they had been at training only last week for staff on how to deal with racism and that they had been the only setting who were able to say, that it wasn't an issue they had come across. There are lots of opportunities for parents to meet up and share cultural experiences and learn about what might be expected of them in the new country where they now live. The Kita has a dedicated parent room, where 3 days a week there is a member of staff on hand to talk to parents about any issues they might have & that member of staff can attend meetings with the parents that they may need to go to with government bodies. This is an aspect that I would like to see better covered within schools back home - I think we could be doing more to help migrant families navigate their way through an alien system, either by working with another local body or offering such a service in house through a cluster of schools working together. It is not good enough to expect families to have access to computers and printers if they need to use official forms. There is a real sense of being a responsible citizen within any of the people or groups I have met up with but also an emphasis on only getting involved in issues that directly affect you rather than getting involved in all issues - something we could learn to take notice of back home too. I found out back in March and have been planning my study trip for a few months and lo and behold it has actually arrived! I think I kept thinking that I would receive an email to say "Hey, Kierna, we made a mistake, you weren't supposed to be on that list" but to my surprise, that never happened and I found myself planning a 4 week trip for the month of July to Germany and Sweden. 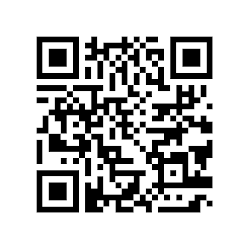 Visiting Spanish teachers passed on information on an amazing FREE app called 'Say Hi' which has proved invaluable for email communication and for translating signs or menus but as usual most people can speak beautiful English and it does make it all a lot easier for me. Last night I wanted a cup of coffee to round of my long day of travelling and those who know me are aware that I am very fond of my coffee, so imagine my surprise when the lady at the coffee kiosk wouldn't let me have it until I repeated the word 'Schwarz' (Black) a few times for her. I really began to understand how the 'Newcomer' children must feel in school when staff repeat a word several times for them to say when all they want is a yellow crayon! She wasn't being mean, she simply wanted me to be able to order a black coffee the next time I needed to. For those who might find themselves saying that those who migrant to new countries need to pick up the local language as quickly as possible, I want to know have they ever spent any time abroad where they don't speak the language. It is isolating and you can't really engage with people the way you want to and you really can't be your true self. I am finding myself smiling a lot at people and nodding and saying the one or two German words I have managed to pick up and now I know a little bit of how some of our migrant parents feel when they need to engage with staff at school. Over the next 4 weeks I want to research different practices to help migrant families and preschoolers to best feel at ease in a new situations, with a view to being able to bring some ideas back home to share within my own school and the wider community.